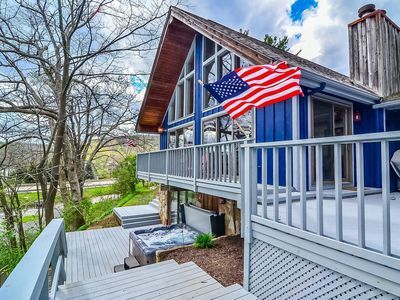 A DREAM DEEP CREEK LAKE VACATION IS WAITING FOR YOU AT THIS PRIVATE, SPACIOUS, AND DELIGHTFUL MOUNTAIN CHALET! 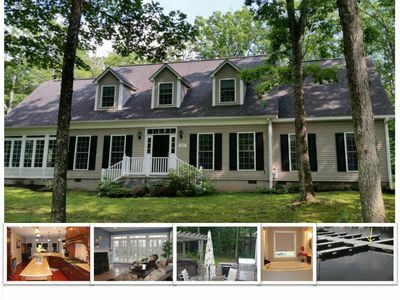 Enjoy your stay in this 3 level, 5 bedroom, 3 full bath beautifully decorated home that has plenty of room for everyone! 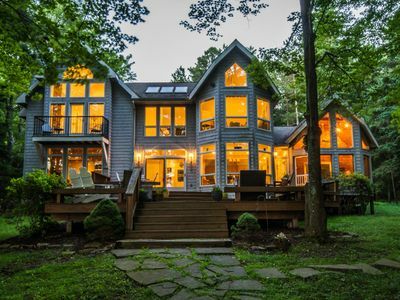 With a spacious and airy feel, the open floor plan greets you as you walk into the main level great room to find a beautiful stone fireplace centered in a wall of windows that travel to the top of the cathedral ceiling. 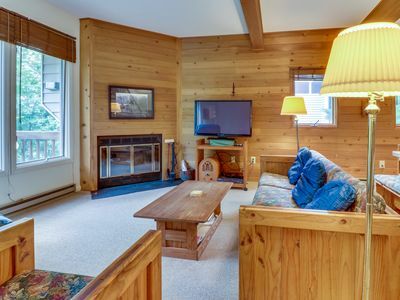 To your right is a galley style full kitchen with a breakfast bar, warm wood details, and all the amenities you want. 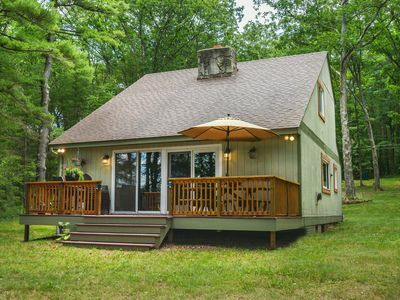 The large dining area joins together the kitchen and great room to give you access to both wonderful wooded views and the warmth of a fire while you are sharing family memories around the table. 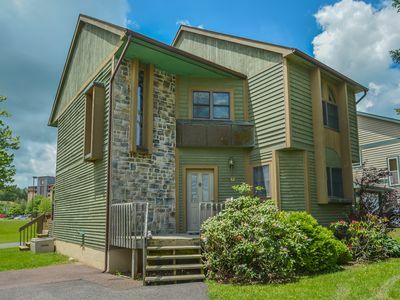 Walk down the hallway to find more comforts and conveniences with a bedroom, full bath with a luxurious jetted tub, and an in-home laundry area, all with the warm wood plank ceilings. 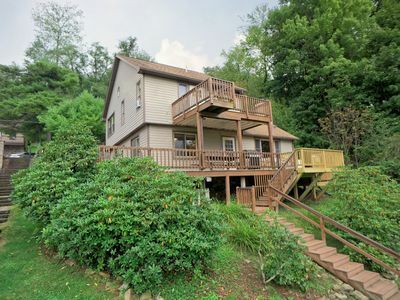 Venture up the open stairway to find a unique and relaxing loft area perfect for enjoying a little quiet time, two additional bedrooms and a full bath. 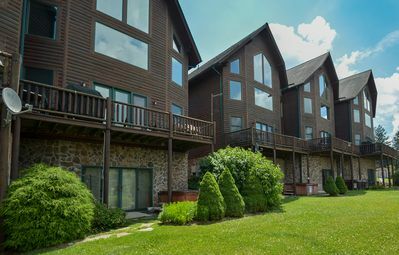 The lower level provides the perfect entertainment area in a large recreation room with a pool table, stone fireplace, flat screen TV, comfortable furniture, and plenty of games for everyone, along with two additional bedrooms and a full bath. 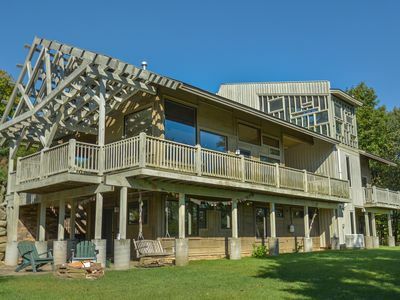 This home offers two fireplaces, plenty of ceiling fans, and central air conditioning, so no matter what the season, you will be comfortable. 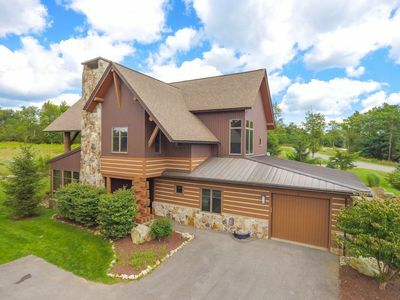 As you drive down the wooded and picturesque paved driveway, you will have a sense of being away from it all, yet, this home is so close to everything the Deep Creek Lake resort area has to offer! A large paved parking area will provide you will plenty of space for everyone’s vehicles and toys. 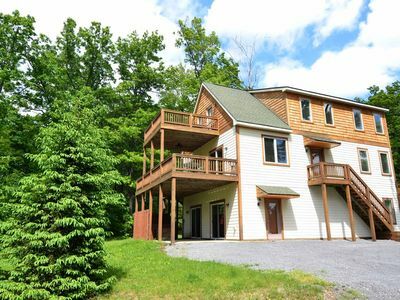 This home offers 4.5 acres of wooded privacy with a gently sloping green space and a stream running through - perfect for exploring and sharing walks together. 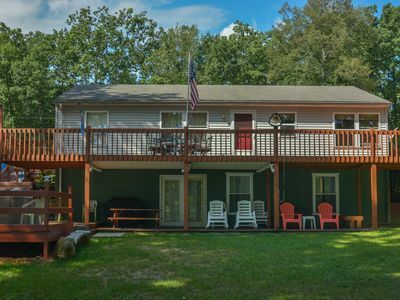 Join together with your family on the large wraparound deck with plenty of seating and a gas grill for your use, or enjoy a cool evening around the firepit sharing stories. 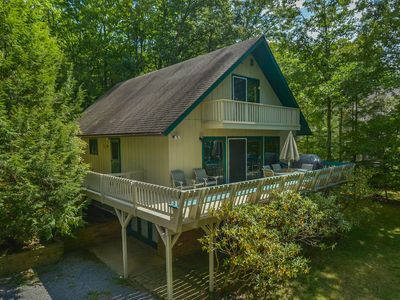 A covered hot tub is the perfect place to unwind after a day filled with adventure. 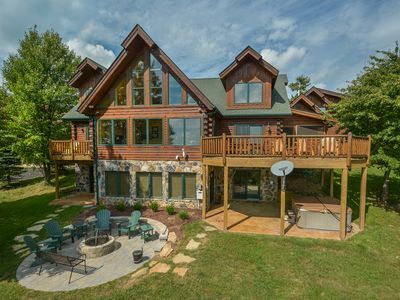 RESERVE THIS HOME AND COME TO DEEP CREEK LAKE AND FIND WHATEVER YOU ARE LOOKING FOR IN THE PERFECT GETAWAY! 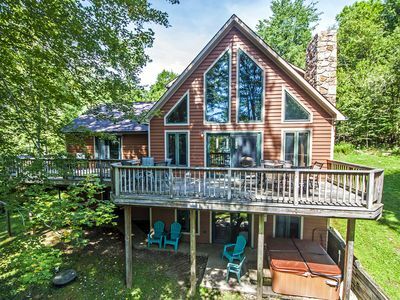 Amazing lake views, walk to Wisp Resort, central location! 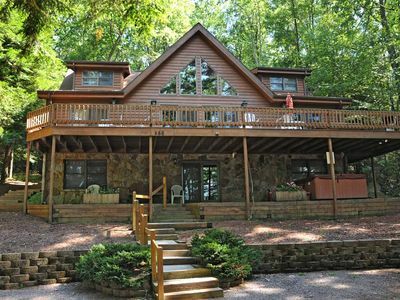 Fabulous 4 Bedroom Mountain Villa in the heart of Deep Creek Lake! 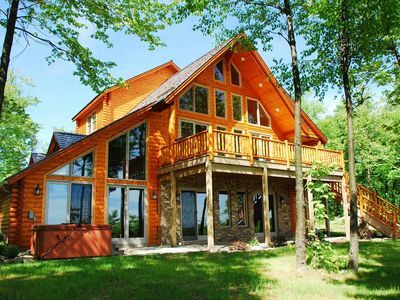 Extrordinary 5 Bedroom Luxury Mountain Chalet is your Dream Vacation Home! 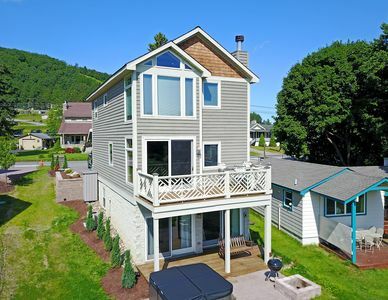 Alluring 3 Bedroom Ski In/ Ski out home w/ amazing slope views! 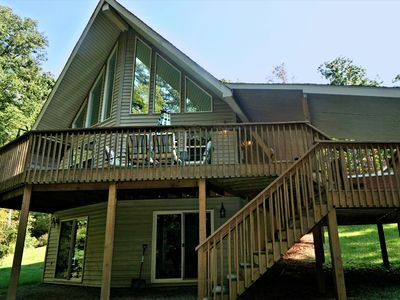 Lake Views within 5 Minutes from Wisp Resort!